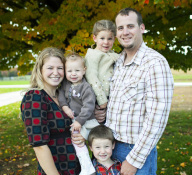 RJ and Keegan were married in 2006 and live with their family on the farm. They have four children Logan, Murphy, Ryan and Griffin. 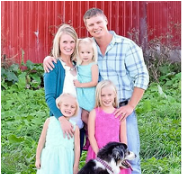 RJ works on the farm focusing primarily on the corn, soy beans, hay and cattle. Keegan is a massage therapist, P&E chair person of their local county farm bureau,and a stay at home mother of 4 little ones. Jon and Lani met while serving in the United States Army. They have both completed Active Duty Tours for the Army overseas. They were married in September of 2011. Lani continues to work for the United State Army. Their son Gregory attends Central Lake Public Schools. They both enjoy horseback riding in their spare time. Greg and Jenny: Greg and Jenny both grew up in Central Lake and graduated from Central Lake High School. Greg and Jenny were married in August of 2006. Jenny has a Degree in Education from Grand Valley State University and works for Northwest Michigan Community Action Agency as a Central Lake Family Community Navigator supporting children and families through the Cleo M Purdy Endowment. Greg and Jenny have 3 daughters, Claire, Alison and Lauren. Rob and Mishelle are natives of northern Michigan. Rob grew up on the farm while Mishelle grew up in Traverse City. Rob’s main focus on the farm is fruit where he assists on managing our 250+ acres of cherries while also managing our 10 acres of grapes that were planted in 2016. Mishelle works at the Charlevoix County Community Foundation where she is a Program Officer and oversees the Youth Advisory Committee and all youth grants, works with donor advisors and manages numerous scholarships for Charlevoix County youth. They are exhausted, yet proud parents of twin two-year-old boys, Jordan and Drew, who are already following in their father’s footsteps with the love of tractors.